It was made of face stone. 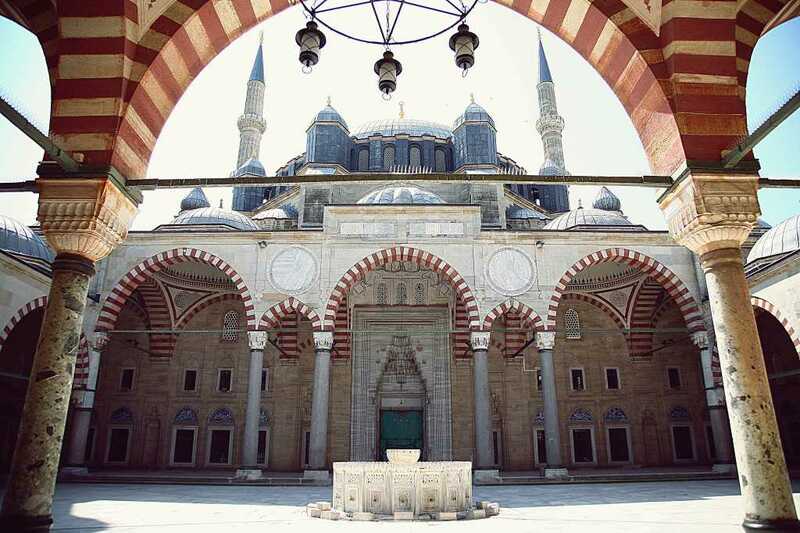 Because it covers the area of 2.475 m2, the enormous construction was chosen as the largest mosque in the world. 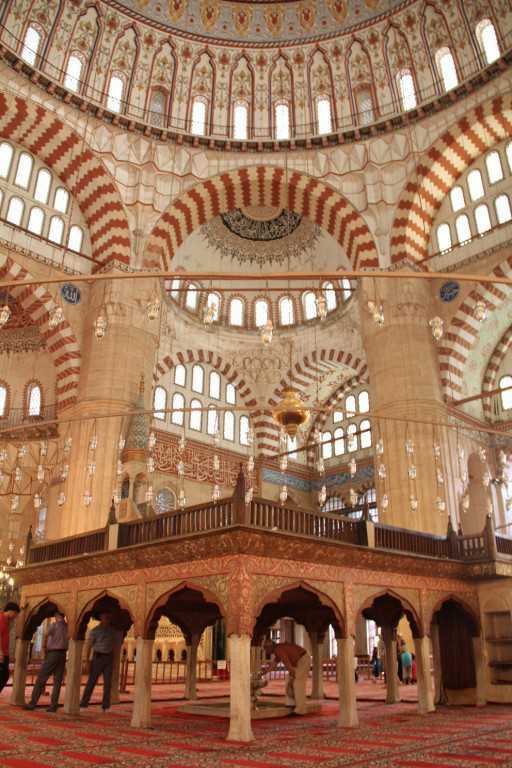 When it is looked at the building history of the Selimiye Mosque, it is said that at the beginning there was a palace established by Ottoman Sultan Yıldırım Bayezid in the same place. But then it was demolished due to not durable. Finally, genius artist Sinan succeeded this magnificent mosque to get our day. Today, many engineers and architects coming from everywhere tried to secret of the mosque building but they cannot completely figure out it. Therefore it took a place in UNESCO’s World History Heritage Candidate List. It was used never seen before a unique technique in the building of fascinating mosque or sanctuary which creates a climax for it by exceeding the other monuments. Dome of mosque is approximately 43.28 m high and 2000 ton weight. 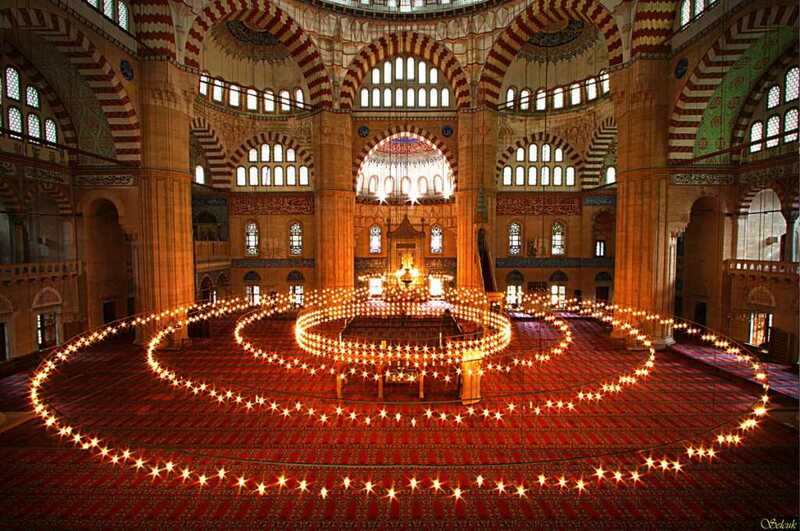 Placed on the eight pillars or columns (fil ayagi in Turkish), the constructing method of this mystic dome was discovered by great Sinan. Because of that, dome has attracted the visitors today from past. When the people see this huge dome, they say wow and how that enormous dome was established. Moreover the diameter of dome is 31.22 meters. When it is examinated the other domes, there are many enormous dome such as the dome of Mehmet Ali Sah Mausoleum in India,Panteon Cathedral in Rome and St. Pier Church in the world. 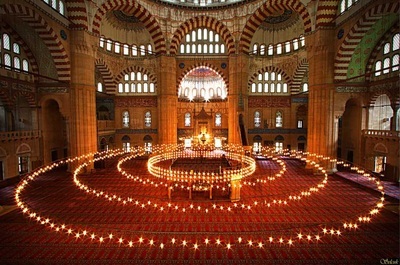 For example that; Hagia Sophia’s domes are the same seizes with this mosque’s dome. But those domes have the same features except for the dome of Selimiye Mosque. Its balanced and coherent interior section charms the people. 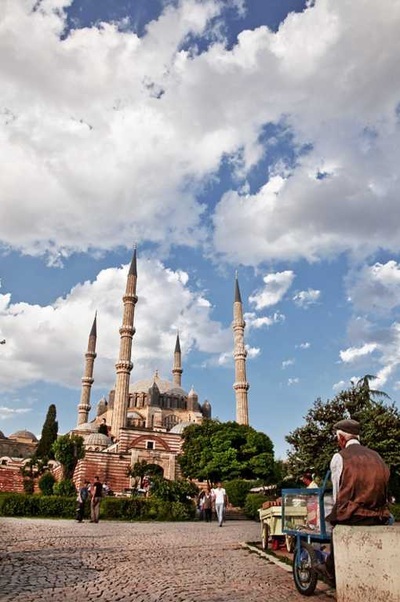 The mosque contains four elegant minarets with three each minaret balconies which is 3.80 m in diameter and 85 m in high. Located on in the corners of northeast and northwest of courtyard, two minarets have three stairs which reflect the original method. 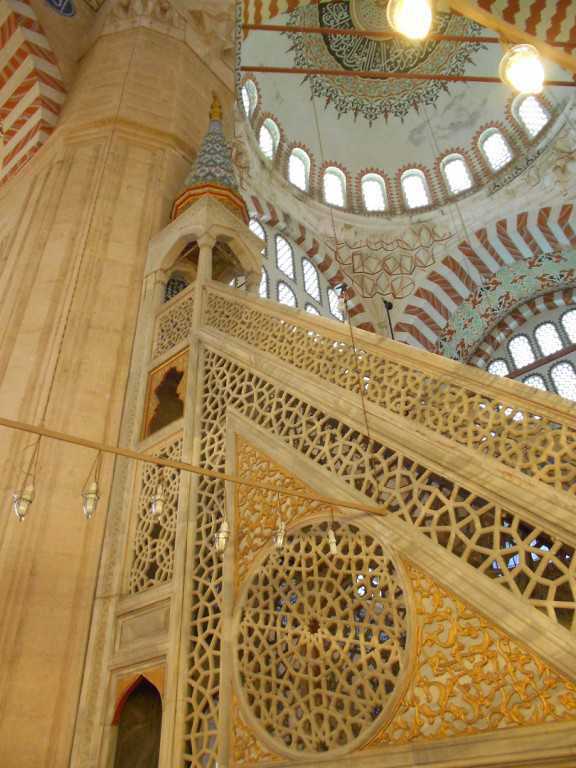 Because by using those stairs, the muezzins can arrive at here without any obstacle. This is the unique and perfect mechanism of Selimiye Mosque. It is a place where muezzins announce the imam (muslim religious leader) sayings when they perform prayer.Some of those gathering places made of wood or stone was placed on the anteroom and pillars which are 2-3 m long. Surrogated by original railings made from walnut, that structure was damaged but later when it was renovated, there was turned out the other ornaments such as apple tree damasked motives and green, red colours upon it in 1984. One of the most attracting events is the reverse tulip motif. It is seen that nearly all surface mounted paintings, wooden painting and tile workings was furnished with many various sizes, colour and shaped 101 different tulip models. Also it was carved into marble column carrying the muezzin gathering place. The reason of that, according to muslim, the motif of tulip symbolizes God thanks to its name meaning God in Arabic letter ‘’ هلال’’. According to another story about tulip, it reflects durableness like that mosque. Situated on the left face corner, that location is called as Hunkar Gathering Place. It was placed on the four special columns connected with the four arches. Once upon a time there contained many original tiles but after the Ottoman-Russian Wars in 1878, they were ravelled out and carried another place. Two equal rectangle shape consists of splendid entry door and a roofless, pot shaped sadırvan (water-tank with a fountain) made from white marble. 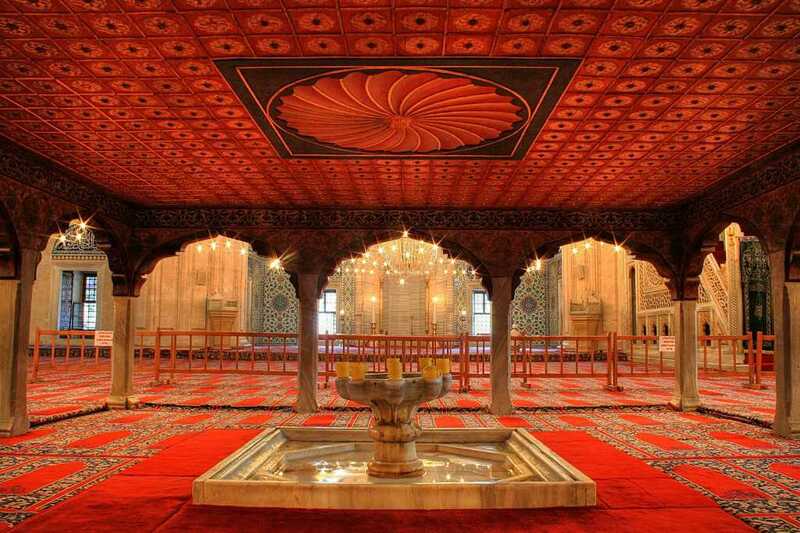 This wonderful sadırvan reflects the Ottoman Classic Architecture Style. There is also found many Iznik tiles; it is seen that many tiles are carved with the surah al-fatihah by the order of Ottoman Sultan Selim II. Various parts of the mosque were thoroughly furnished with the fascinating tiles.